An art exhibition stirred visitors who dropped in for coffee and cakes at St Eustachius’ Parish Church, Tavistock on Friday, August 25. 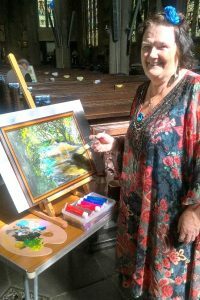 More than 60 pictures were displayed by artists from all over the area, with everything from watercolours and acrylics, to pastels, pen and ink. Subjects ranged from moorland views and seascapes, to local scenes, including St Eustachius’ Church ruins. Some items were for sale. Crapstone artist Tony Arnold exhibited six pieces of abstract art, which attracted many people for their colour and movement. 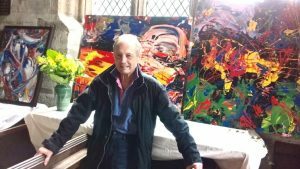 ‘I call two of them “action paintings”, said Tony, whose style has evolved over 35 years of painting. Coffee mornings are being held in church every Friday morning until the end of November and will resume after Christmas. They are organised by the Church Craft Group, each one having a different theme, including plants, wood carvings and crafts. May our eyes be the eyes that see the poverty in our world. May ours be the ears that hear the cries of your people. May ours be the hands that work for transformation to bring about your kingdom on this earth. Great God this is our prayer. The loving God with arms outstretched to those who turn their backs and say “I need no-one”. So he gives Himself to a cross to emphasise that love poured out. So full, so free for you and me. The invitation stands each day to taste and see. Just try, just taste and you will see. INCREASING numbers of families are being welcomed to the monthly ‘Messy Church’ sessions at Tavistock Parish Church. The after-school get-togethers combine creative crafts, bible-themed activities, music and worship, rounding off with a shared hot meal. Since the group was launched in March last year, 62 families have been welcomed, with 15 adults and 25 children regularly attending and some 50 people, including helpers, sitting down to eating together. Sarah Pendle, who runs the group, said since the group’s launch 13 sessions had been held, including three summer ones (“Mini Messy”) and a Saturday one. Sessions have included the parables of Jesus, Creation, the Bible, Mountains, Joshua, Christmas and Easter. Worship is led by vicar Chris, assistant curate Steve Martin and Sally Pancheri. Sarah said through activities children shared what they had learnt about God’s word. Singing was greatly enjoyed and during worship time prayers were written and read out by children, then displayed on the Clothworkers’ altar and used in intercessions. She thanked the PCC for funding the group and all supporters. Families are welcome to just turn up at any “Messy Church” session, usually held the first Wednesday of the month. The next one is on Saturday July 1, 3.30 pm to 5.30 pm. Every time we attend a service a small folded piece of paper is given to us with the service booklet and, as a sideman, I am surprised at the number of these which are handed back afterwards. The ‘pew sheet’, as it is called, is a leaflet given out for use not only during the current service but throughout the coming week. Let’s take a closer look at it. On the front we are given the times of the services for the current Sunday, together with a welcome to visitors and newcomers as well as information for those attending with children, any who have sight or hearing problems, and those who wish to donate via Gift Aid. Inside the leaflet are listed the music to be used, those leading the services, the readers, preacher, intercessor and those taking up the offertory, all of whom need our prayers before the service starts. The collect, readings and psalm follow, which we can look at before the service and afterwards for reflection. The references for the readings for the following Sunday are then listed, followed by suggestions for daily prayers throughout the coming week, carefully chosen to observe happenings in our church, town, country and in the world. Names of the sick and infirm who have requested our prayers follow, then those of the recently departed and any who are to be married or baptised during the week. 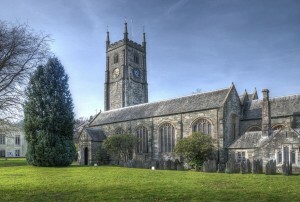 The next section gives full details of the Sunday services within our benefice of Tavistock, Gulworthy and Brentor, including a list of events and services taking place during the week and any saints’ days and anniversaries of significant occasions. The final page lists notices of forthcoming events and practical information for reference. So this little piece of paper is a mine of information which I personally use daily and feel lost without. To misquote a well-known saying, ‘The pew sheet is for all the week and beyond, not just for Sunday’. my attention on You alone.